GAITHERSBURG, Md. — Montgomery County speed cameras yielded roughly the same number of tickets each year since fiscal 2013, according to figures obtained by WTOP Ticketbuster. 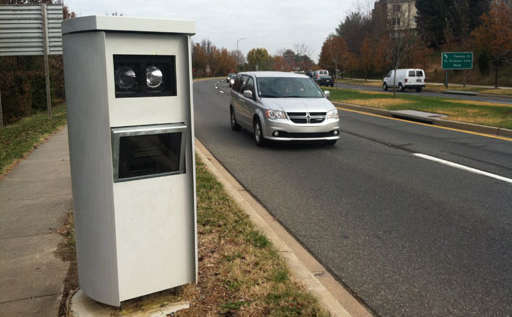 The number of tickets issued by Montgomery County’s speed cameras has hovered at around 450,000 each year. Specifically, Montgomery County issued 451,972 speed camera tickets in fiscal 2013 and 449,208 in fiscal 2014; they’ve issued 355,321 tickets through March 2015, putting the county on pace for 473,761 for the fiscal year. Comparatively, Prince George’s County has seen a 33 percent drop in speed camera tickets over the last three years. Montgomery County is the only jurisdiction in the state that can operate cameras in residential areas because its program predates state law. Other counties may use school zone speed cameras, but those can only operate weekdays between 6 a.m. and 8 p.m.
“We have such a speeding problem in the county that there are plenty of locations in need, but we change behavior sufficiently before we move those speed cameras,” Didone said. Montgomery County has 92 speed cameras: six cameras on vans; 56 cameras that are fixed, and 30 that are portable. Prince George’s County, in comparison, only has 70 speed cameras. Under Maryland law, net revenue from speed cameras must be spent on public safety. Montgomery County Executive Isiah “Ike” Leggett gets to decide which public safety initiatives receive funding from the speed camera proceeds. Net revenue from Montgomery’s speed cameras brought in $8.3 million in 2013 and $8.1 million in 2014. This year, revenues were on pace to net $8.6 million. “If these monies weren’t there, sidewalks wouldn’t be built. [Fire and rescue] would not be available. So this money is turned around to be utilized to keep and promote safety on our highways and roads,” Didone said.